Did you know ? 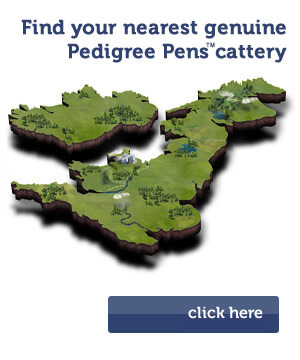 Pedigree Pens Ltd. are featured in Cattery Design by Leading Kennel and Cattery Designer David Key. His book contains step-by-step cattery building guidance and advice on plans, construction, materials, equipment and all aspects of your design. This book is a complete reference guide and takes you through all the options you need to think about before building or updating your cattery. It features advice from cat welfare experts, Dr. Irene Rochlitz and Nadine Gourkow. It also features fascinating case studies from successful boarding catteries, and world renowned charities such as Blue Cross, Cats Protection, Feline Advisory Bureau, RSPCA and Wood Green Animal Shelters. 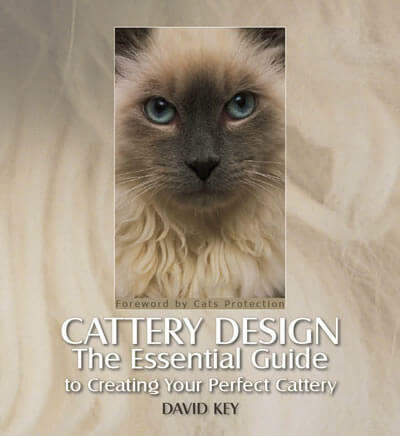 This essential guide is an easy to read, encouraging and inspirational overview of cattery systems, equipment and materials. It contains step-by-step guidance for creating the perfect cattery with real life case studies. This book will help you understand how catteries can be improved with cat welfare knowledge. It also contains some 400 large colour photographs, many of which are full or double-page spreads showing lots of detail. From Amazon: “How many of us dream about changing our lives, starting our own business, working from home in a beautiful countryside location, spending more time with our beloved pets, and making a difference to the lives of cats and their owners? You probably already have a multi-cat household, but whether you have always dreamed about working with cats, have just realised that this is what you want to do with your life, are already lucky enough to be working with cats, or you are just interested in cat welfare (generally or professionally) – you will adore this inspirational book. If creating a cattery is what you dream of, then naturally you will want to provide the best accommodation and care, earn a good living, have fun and love what you do: providing a healthy, safe, loving environment for cats. Whether you are interested in what makes good housing for your own cats, boarding, rescue or breeding – the foundation should be good cat welfare. If you would like to purchase Cattery Design, you can do so by visiting our Amazon Store.